The global bovine blood plasma market is currently gaining strong traction from the increasing demand for nutritious products in the food industry and strong investments on the research and development of new drugs. According to a recent business intelligence publication by Transparency Market Research (TMR), the global bovine blood plasma market is considerably fragmented in nature with only a few players holding a considerable chunk of shares as of 2016. The players who operate at the global level, such as Thermo Fisher Scientific, Inc., Sigma-Aldrich Co. (Merck KGaA), LAMPIRE Biological Laboratories, Proliant Inc., Bovogen Biologicals Pty Ltd., Inc., Rocky Mountain Biologicals Inc., Kraeber & Co GmbH, Auckland BioSciences Ltd., and Lake Immunogenics, Inc., are slightly ahead of the rest of the competition. However, there are several small scale vendors too who are eating into the global shares while serving domestic demands. 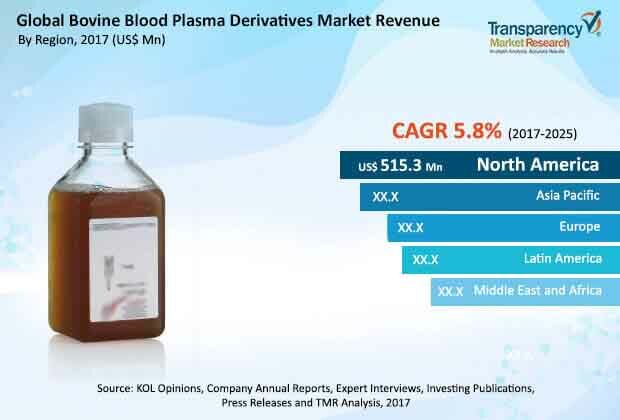 The analysts of the TMR report have projected the demand in the global bovine blood plasma derivatives market to expand at a CAGR of 5.8% during the forecast period of 2017 to 2025, by the end of which the opportunities in this market are estimated to translate into a revenue of US$2,196.8 mn. In the near future, key vendors of this market are expected to concentrate on strengthening their distribution network via collaborations with local suppliers, manufacturers, and raw material suppliers. In addition to that, since there are different industries as end-users, enhancement of product portfolio in accordance to diverse demands is also expected to be a fruitful strategy of the major companies. Moreover, a number of key players from the U.S. and the European region are expected to expand into Asia Pacific to tap into the newly emerging demands. Based on derivatives type, the market for bovine blood plasma derivatives has been segmented into immunoglobulin, fibrinogen, serum albumin, fetal bovine serum, thrombin, transferrin, new born calf serum, and others such as BGG. Application-wise, the market has been bifurcated into pharmaceutical industry, cell culture and biotechnology, diagnostic industry, food industry, research and development, cosmetic industry, and nutrition supplements. Geographically, North America is the most profitable region by a significant margin, promising to provide for a demand in 2025 which will be worth US$867.9 mn. Asia Pacific is another lucrative region highlighted by the analysts of the TMR report. In the food industry, the demand for products with ideal blend of nutrition is escalating. While the sporting consumers have always been conscious about their diet, the awareness among urban populations regarding the right mixture of proteins and vitamins has been improving constantly too. On the back of growing population of geriatrics who commonly require certain nutritional supplements, the food industry is providing a strong traction to the global bovine blood plasma derivatives market. Thrombin, a key derivatives segment of the market for bovine blood plasma, is commonly used for controlling bleeding during medical surgeries, at diagnostic centers, and for various clinical applications such as coagulation assays and defibrination of blood or plasma. Cell culture media is another key application area that is reflecting positively on the bovine plasma derivatives market. In the recent past, the importance of bovine blood plasma derivatives have not only grown in the field of conventional research but also in development and production of vital biomolecules and therapeutics. Demand in the global bovine blood plasma derivatives market to increment at a CAGR of 5.8% during the forecast period of 2017 to 2025. Competitive landscape fragmented, although a few global players hold prominent positions.